A barometric pressure sensor produced for use in hot climates and designed for Aanderaa Automatic Weather Stations and Display Units. 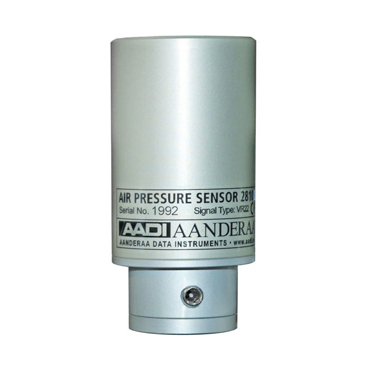 Air Pressure Sensor 2810 utilizes a 4x4mm small silicon chip as a sensing element. In the central area of this chip is a thin membrane that is exposed to atmospheric pressure on one side and to a vacuum on the other. The membrane is furnished with 4 diffused resistors that form a Wheatstone bridge. The output signal is proportional to the atmospheric pressure. The chip thus acts as an absolute pressure-sensing device. The sensor shows outstanding performance as it has practically no hysteresis, no temperature drift and no ageing. It is also insensitive to mechanical acceleration and can be operated in any position. The sensor is waterproof.